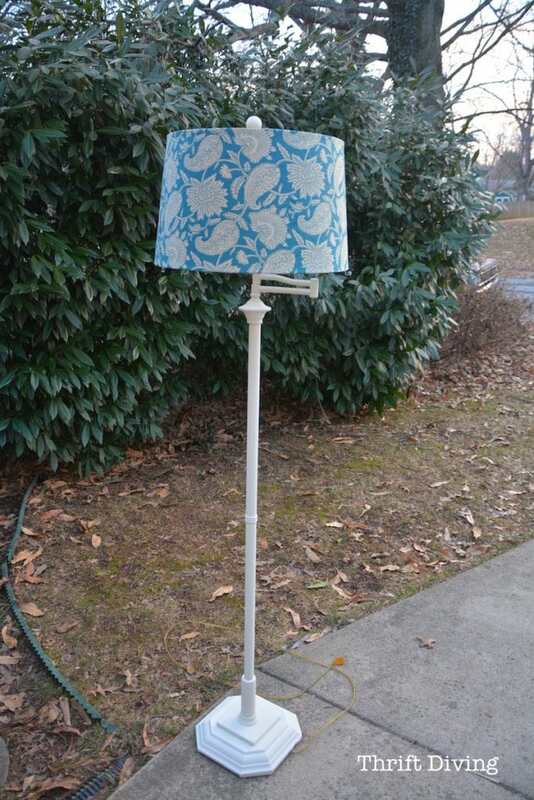 An Ugly Lamp From the Thrift Stores Gets a Makeover! You are here: Home / Crafts / An Ugly Lamp From the Thrift Stores Gets a Makeover! 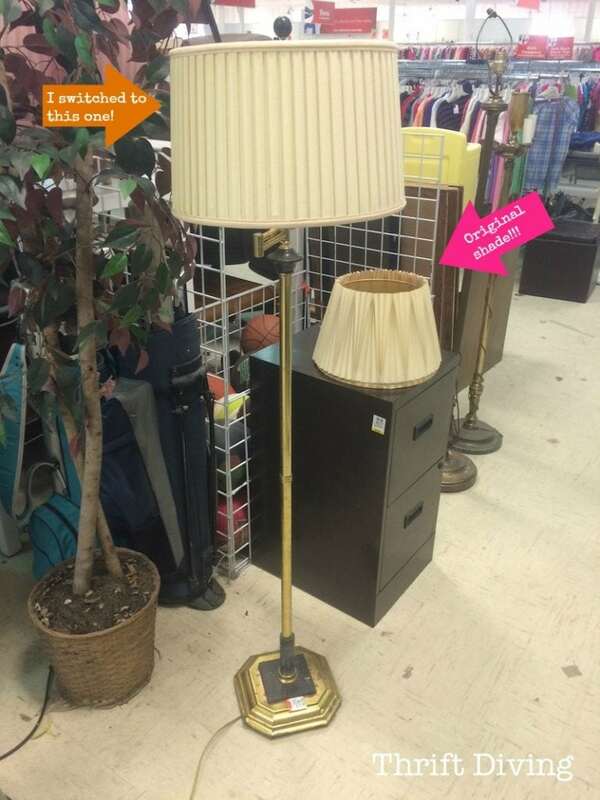 Have you ever been at the thrift store and saw an ugly lamp that look like this one? 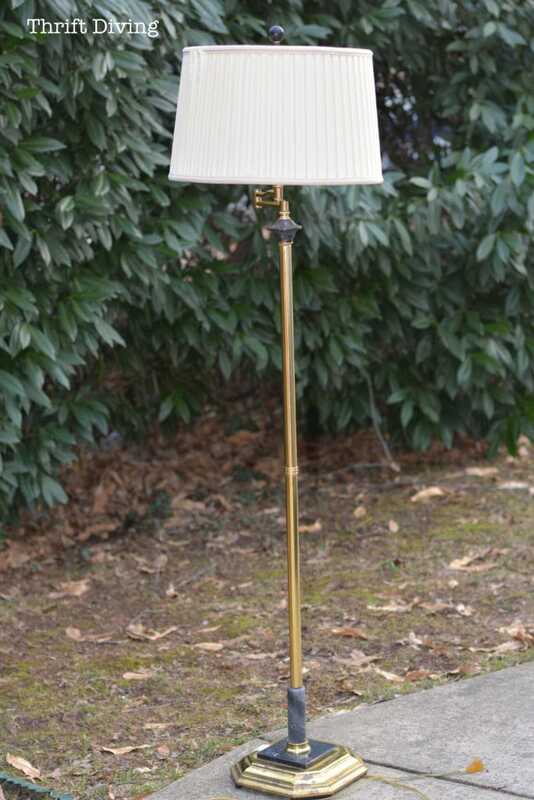 Ugly brass lamps….the kind you just keep walking past. They’re a dime a dozen at the thrift store. This time, however, I stopped. Thank God I did. I knew it had potential. The only thing is that I didn’t like were the lamp shades, so I just switched them. I hope the thrift store didn’t mind! Here’s how this ugly lamp looked before the makeover! And this is what the lamp makeover looked like afterward! Okay, so you probably have an old ugly lamp in your house, or one at your thrift store, and are in need of some new lighting in your house, too. Here’s what you need to get started! (I participant in the Amazon Services LLC Associates Program, an affiliate advertising program designed to provide a means for me to earn fees by linking to Amazon.com and affiliated sites). 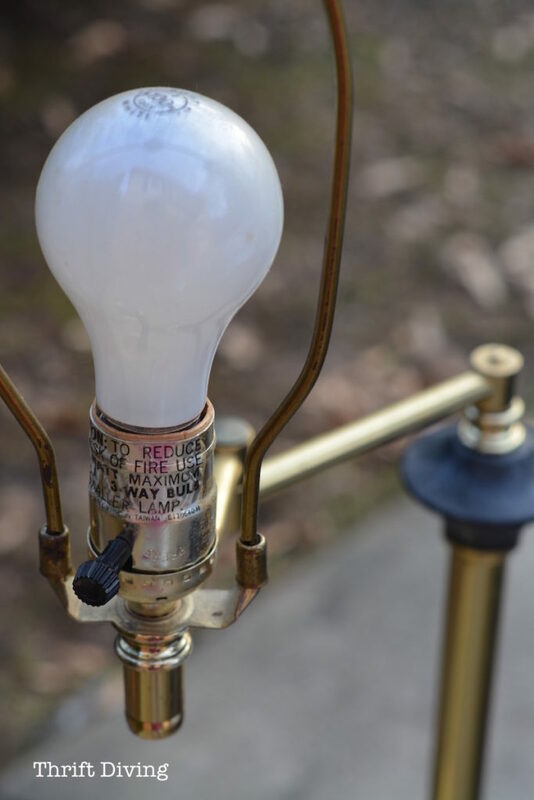 Hit your favorite thrift store or shop your house for an ugly lamp. 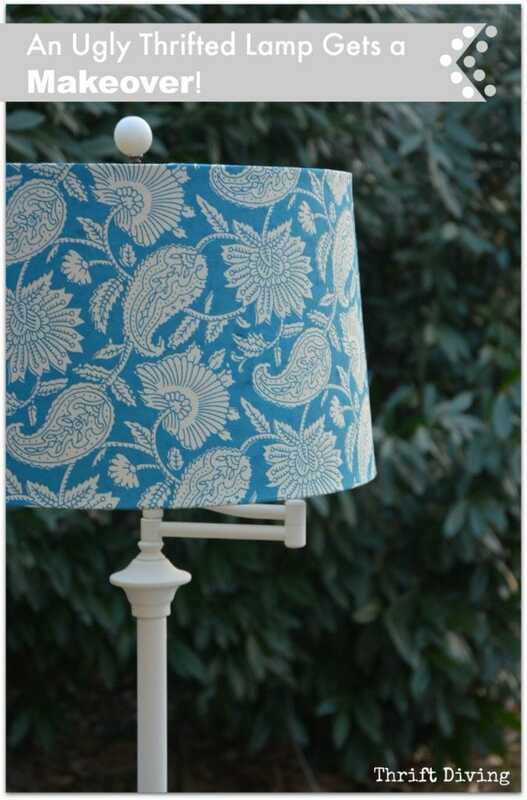 If you’ve got an old lamp shade, great! 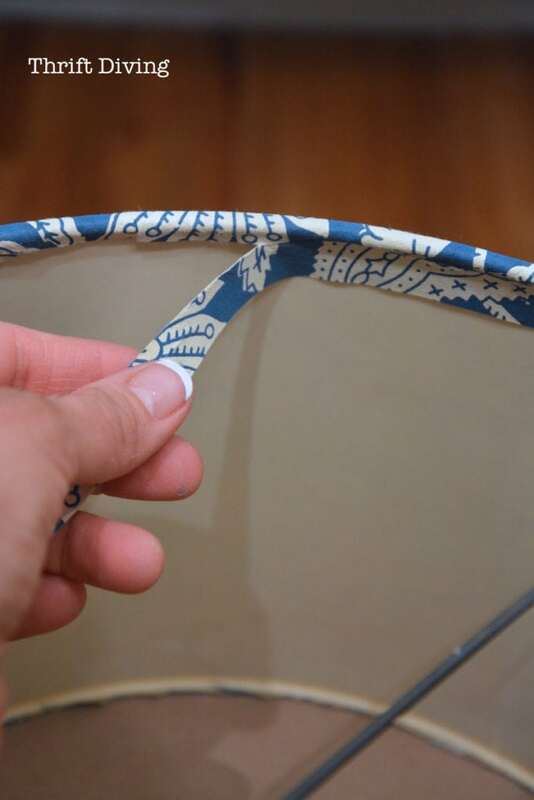 Shades can be expensive, so if you can find a thrifted one or reuse one in your house, that’s best. Here’s mine from the thrift store, for $10. Yep–just $10! It actually doesn’t look too bad (until you get up close……). I loved that this one had a swing-out arm. It will be perfect near the bed, for reading. 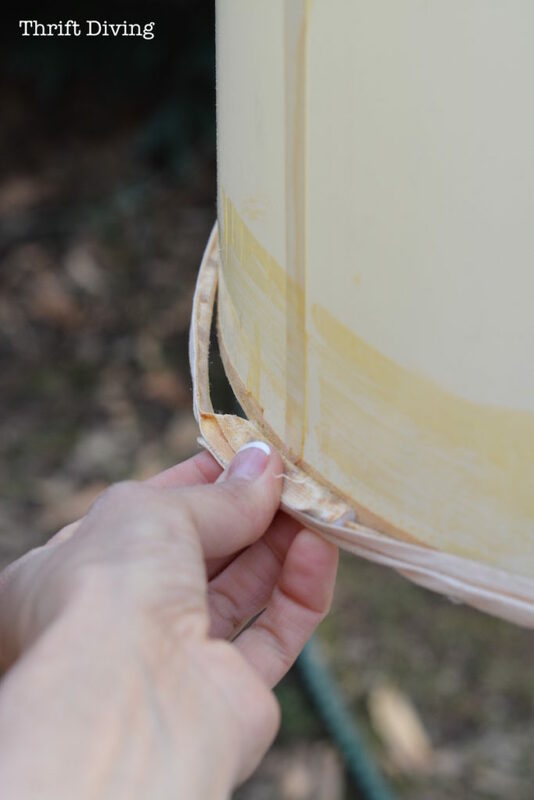 Yep, you can take apart a lamp shade! I discovered this after ripping off the ruched outside layer on this one. Saving the shade will save you big money! 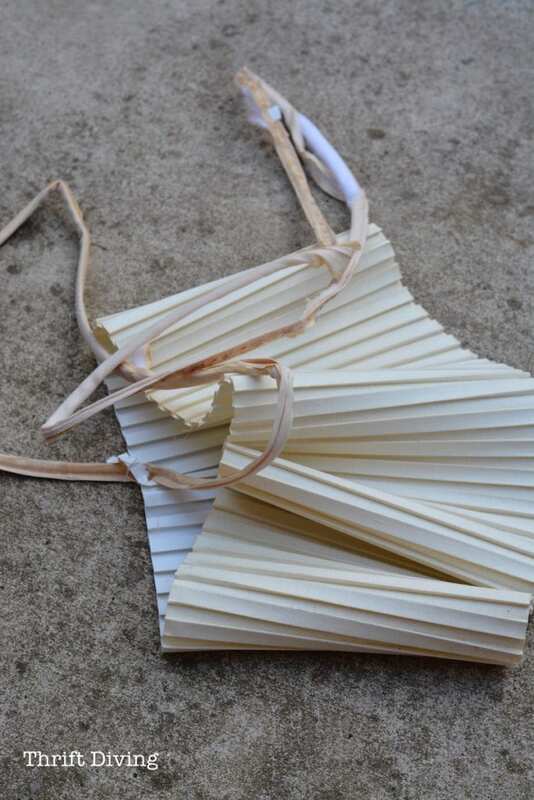 Poor, pathetic lamp shade….. All stripped and ready for a makeover! (Looks like I need to pressure wash my driveway! It’s disgusting). These older bulbs are getting the boot! Seriously, with so many “smart light bulbs” on the market now (or energy efficient light bulbs), you don’t have to settle for standard bulbs. 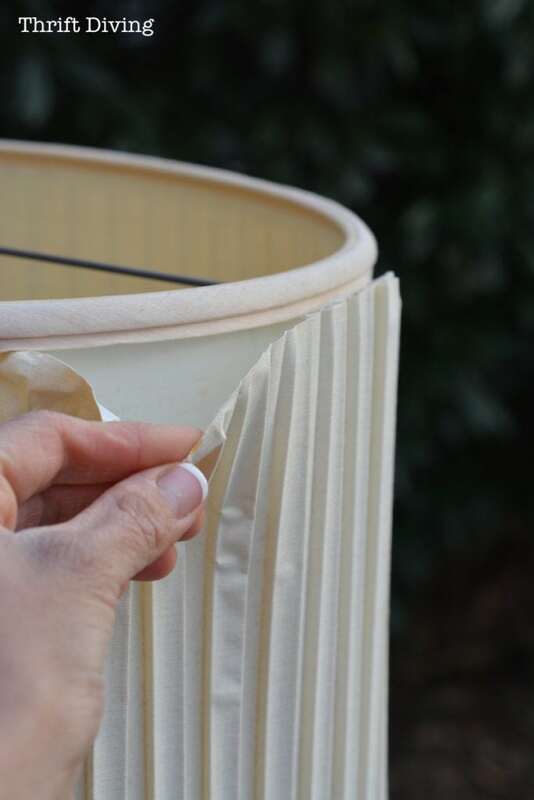 To cover a lamp shade, you can use any type of paper, or even fabric (although I wouldn’t use a totally thick fabric that would block the light; keep it lightweight). This paper, you guys……oooooohh, mannnnn…..I have loved it since I bought it probably 2 years ago. I picked it up from Paper Source (they have the best selection of fine papers for just a few bucks!) and wanted to do something special with it, but never knew what to do with it! So I hoarded it held onto it until that perfect project came along, and it was this project that inspired me to put it to good use. I’m not going to lie. I didn’t know how to do this. 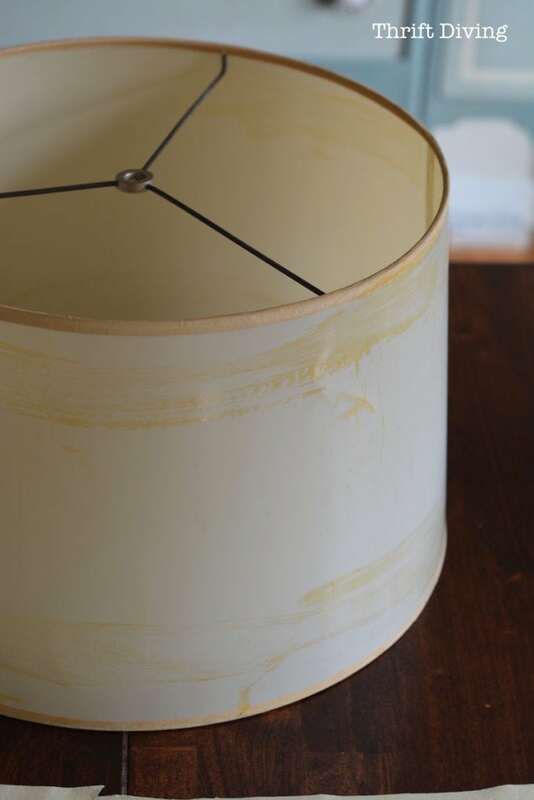 It’s always baffled me how to fit a piece of paper or fabric around a curved lamp shade (I told you that DIY bloggers don’t know everything, did I?). I went to trusty ‘ole YouTube, however, and used “smart light bulbs”to get me started. 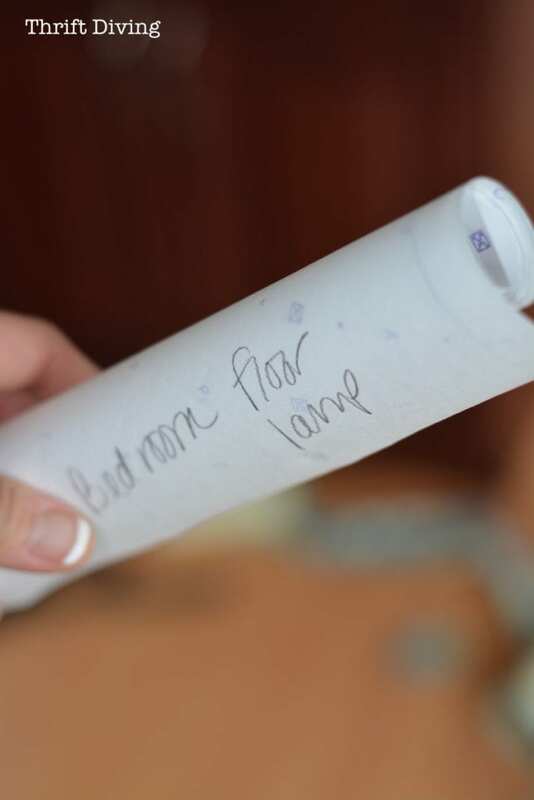 Then I rolled the lamp shade on its side along the paper, tracing with my pencil along the bottom edge until I reached the seam again. 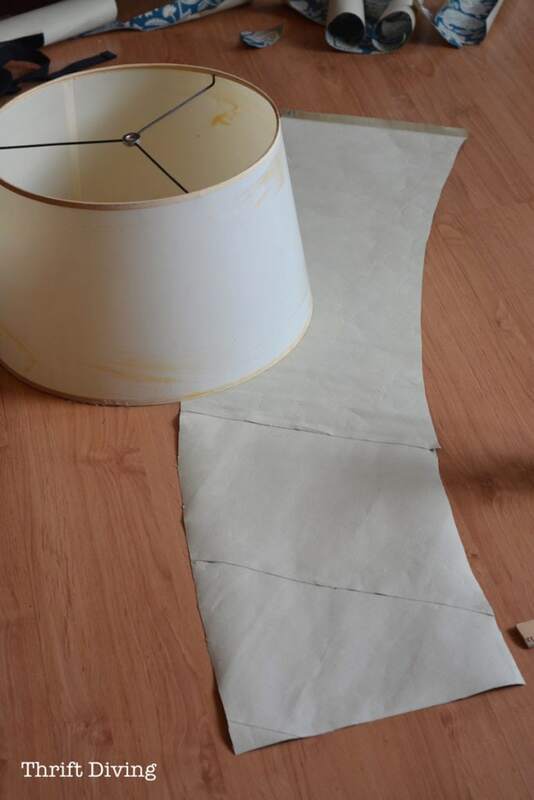 And then I repeated that rolling and tracing with the top edge of the lamp shade. 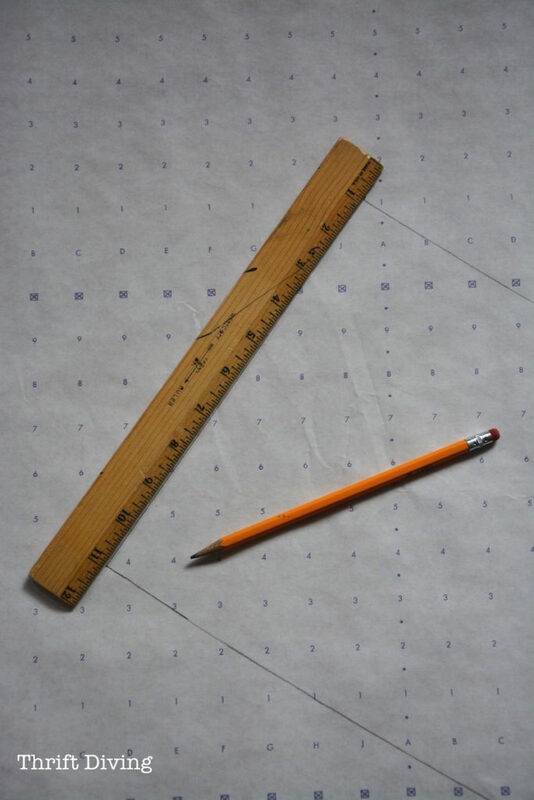 I added 1/2″ seam allowances to all sides. I connected the top and bottom lines at the ends of the pattern. 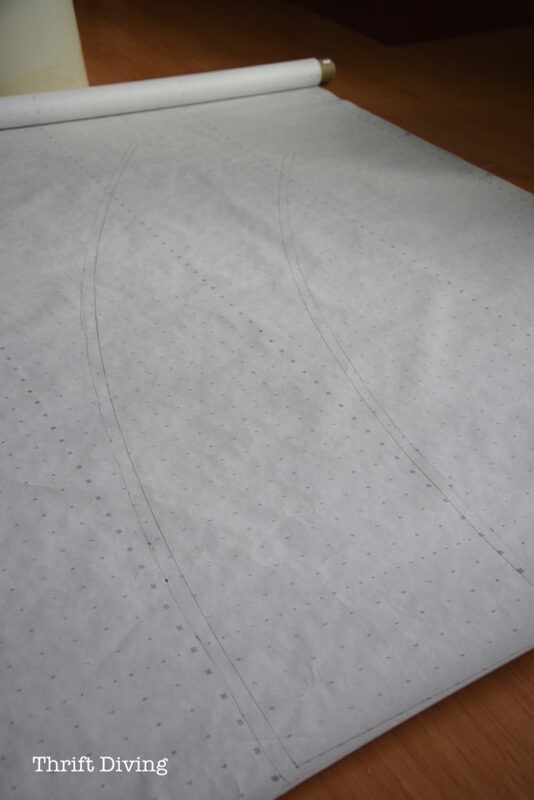 Once completed, the pattern looked like this. Then I cut it out with scissors. What you don’t see is that I actually had to piecemeal small pieces together because I didn’t have enough paper. LOL 🙂 Don’t let this confuse you. It was just me being creative and stubborn because I reeeeaaaallly wanted to use this paper, despite the shortage. 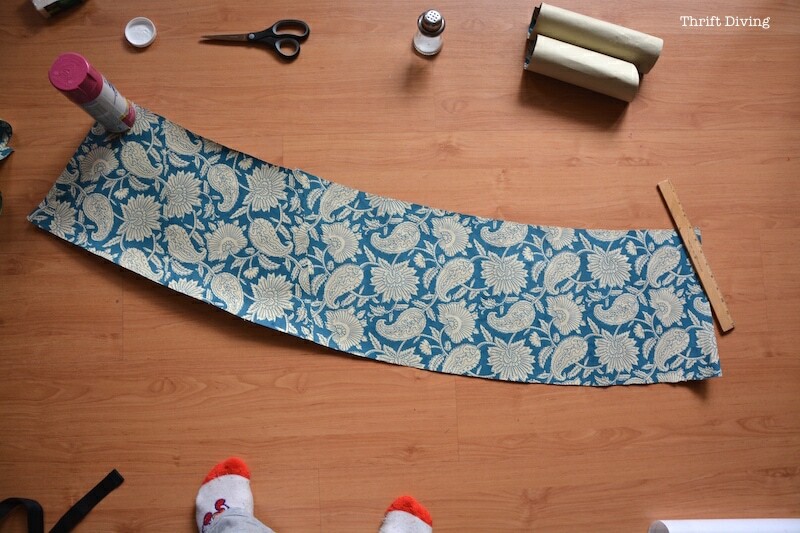 TIP: When you’re done with your pattern, roll it up and store it. If you decide in the future you want to change the lamp shade again, you’ll already have a pattern! 🙂 Label it. 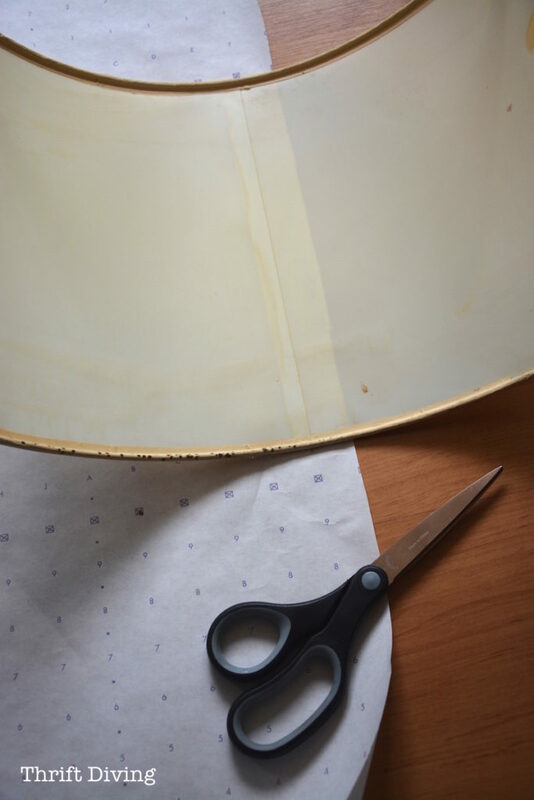 Spray adhesive works great for adhering the paper to the lampshade. Be careful that you’ve got the placement exactly where you want it to be. This stuff is super tacky and paper will tear if you have to pull off to try to adjust. Fabric is easier to adjust, FYI. I sprayed both the backside of the paper and the lampshade itself. 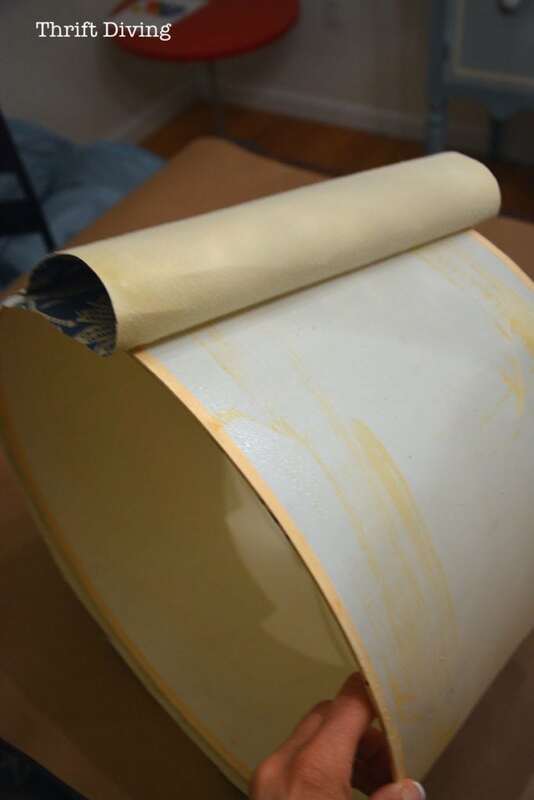 With the lamp shade down on the edge, lining up the seam with the edge of the paper, I began rolling the same onto the paper, smoothing as I went. 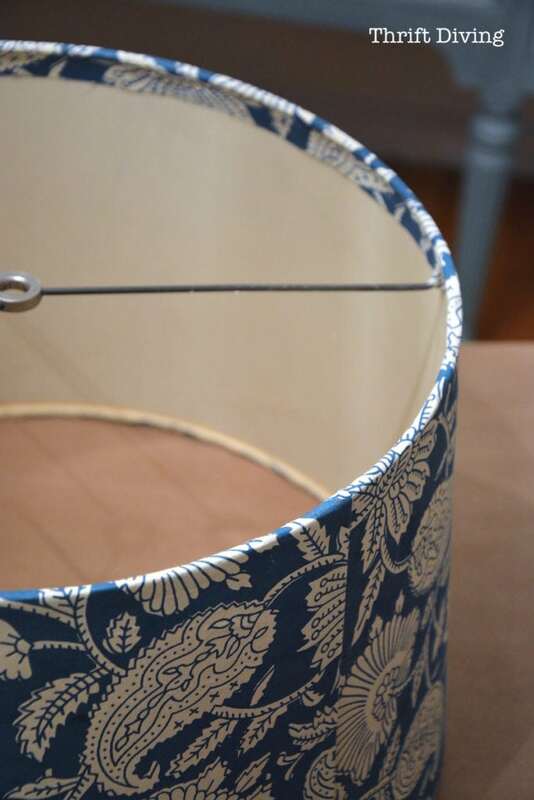 I made sure that I kept that 1/2″ seam allowance so that I can roll the paper over the lamp shade edge. 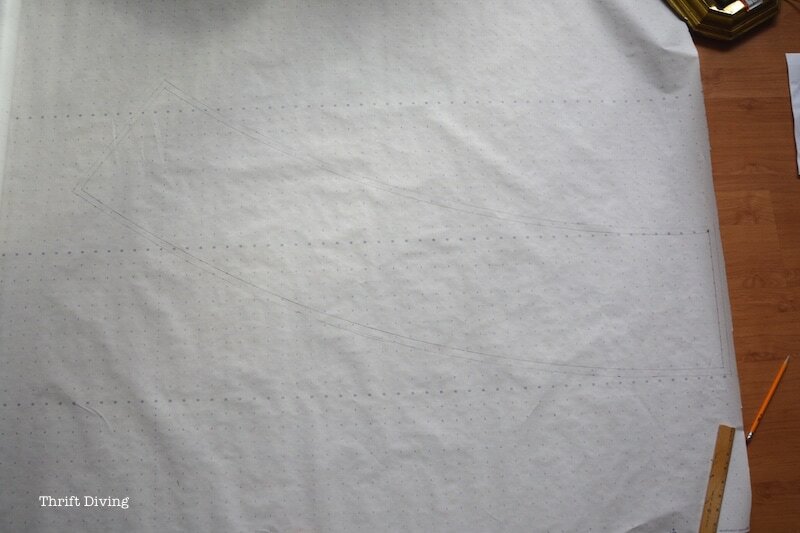 One edge was folded down 1/2″ and I used that to overlap over the seam. 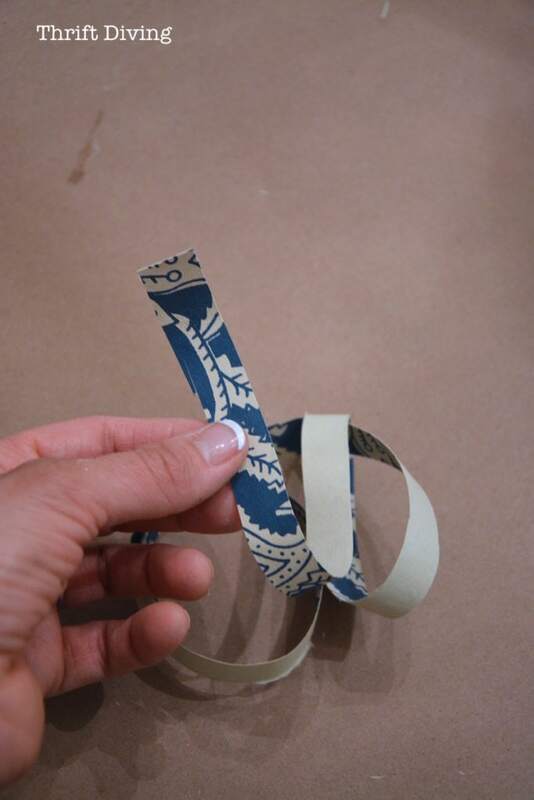 Next, I cut a strip of paper to use on the inside to “finish” off the raw edges of the paper. If you have ribbon, great. I just wanted to use paper. I used a glue gun to do this part (not shown). With the inside trim, it looks great! 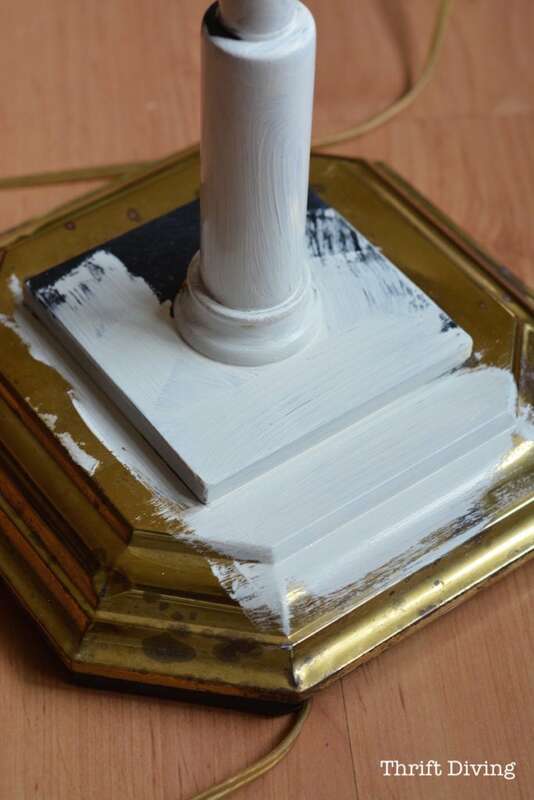 I love chalk paint because it doesn’t require sanding or priming so you can paint a brass lamp without having to sand it or prime it first. You just open up the can of paint and start painting! Just be sure to wipe it down first so it has a clean surface. I usually do two coats for even coverage. You can also use spray paint, which would be quicker. Just watch out for drips. 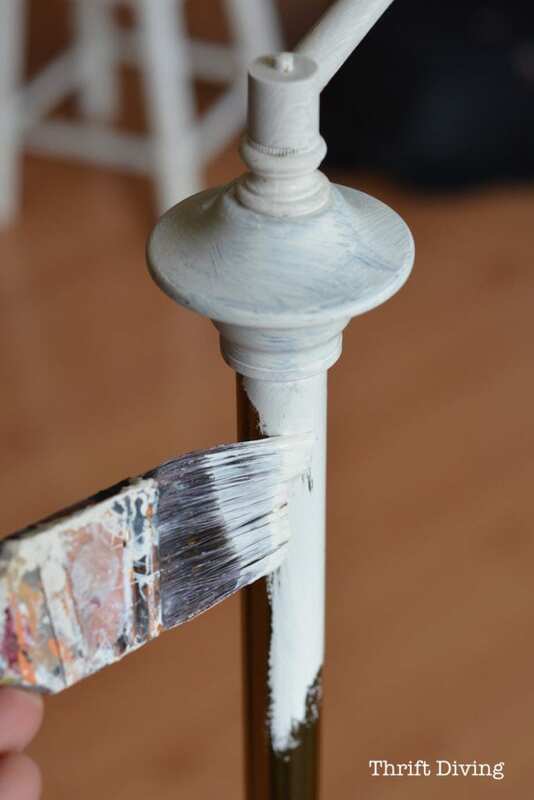 Don’t hold the spray paint too close to the lamp to avoid drips. 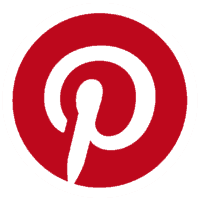 Related: What’s the Best Paint for Furniture? I used Old White, one of my favorites! (A rubber band on the top keeps the side clean from paint when you’re dabbing off the excess paint. I know you shouldn’t technically dip your brush in the paint, but…..well….why dirty up a paint cup??. LOL). STEP 9: Make Over the Rest of Your Lamps! After covering one lamp shade, I honestly think I’m addicted now. It was soooo easy; cost just $15 ($10 for the lamp, $5 for the spray adhesive). 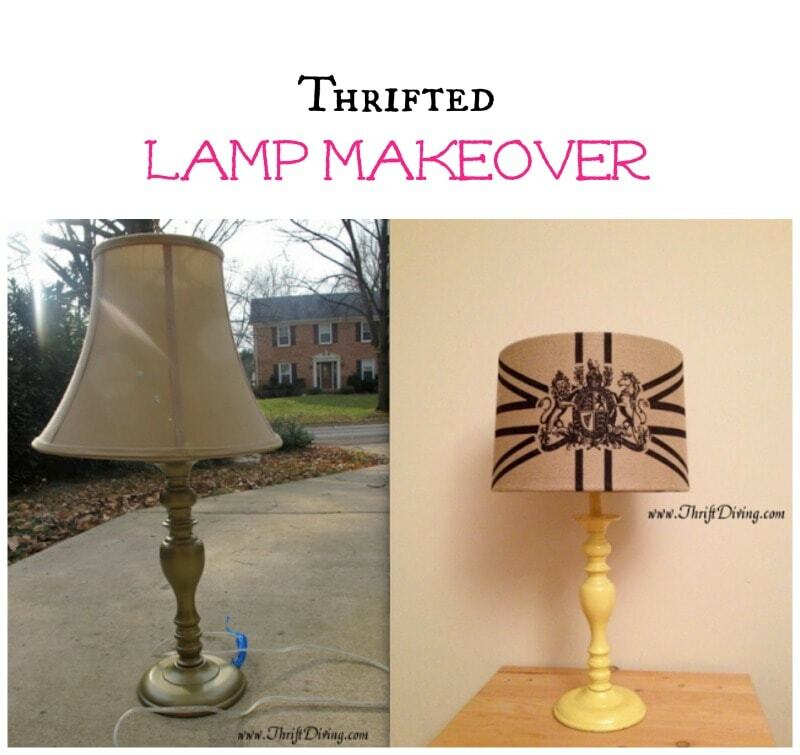 Here are some other thrift store lamp makeovers in my house! 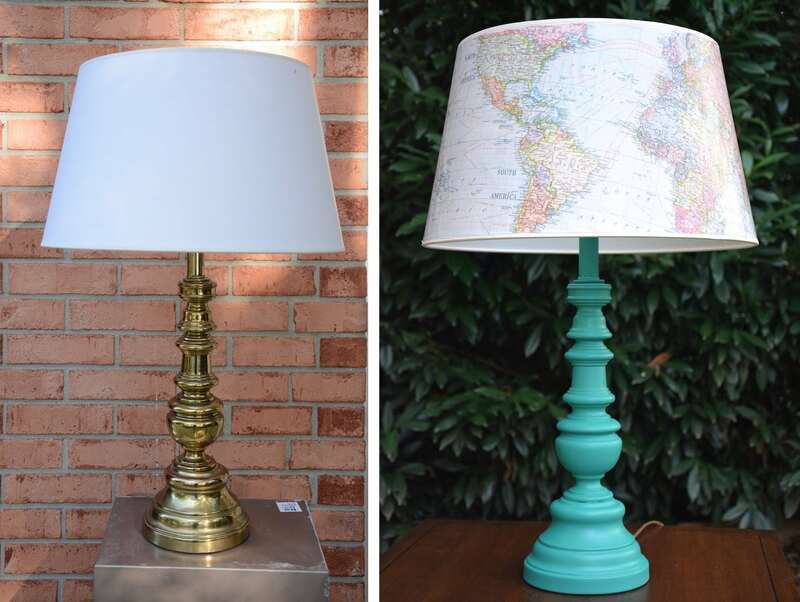 I love how I painted the thrift store lamp base in turquoise and glued a map to the lamp shade! 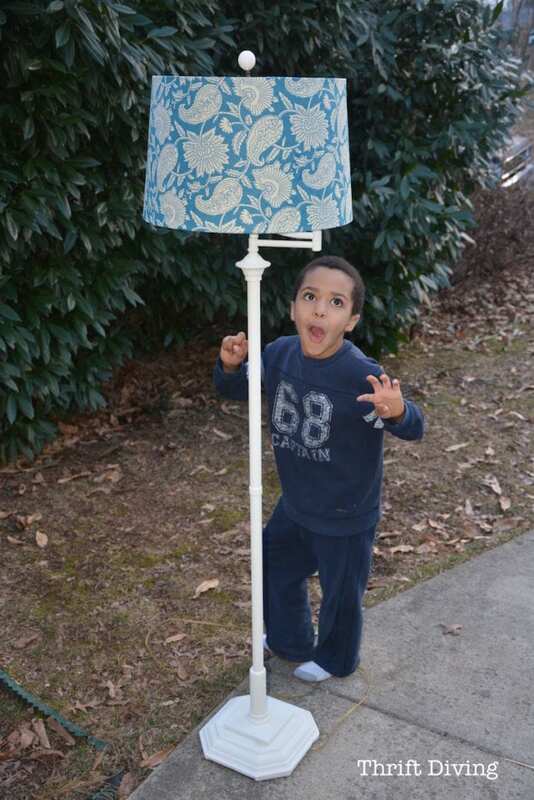 See this thrift store lamp makeover here! This $10 thrift store lamp was so heavy and solid, but it was badly outdated. But a little bit of canary yellow spray paint and a burlap lamp shade that I found at the thrift store, it looks so much more modern! 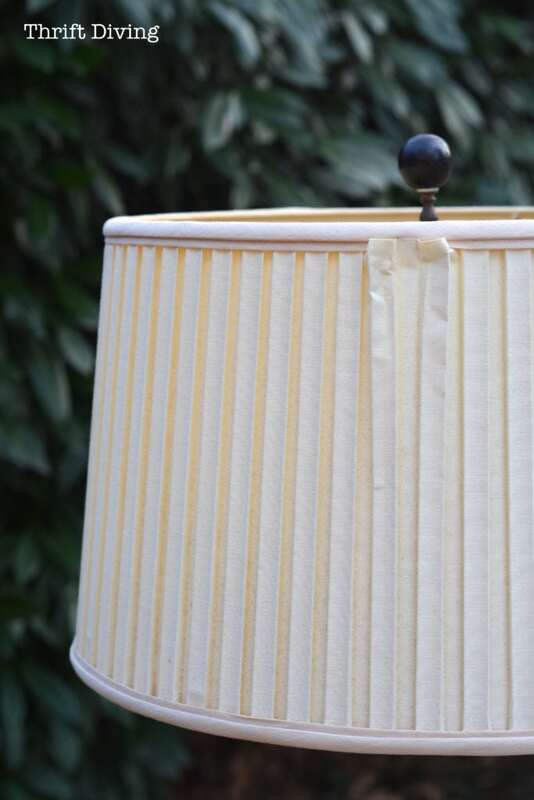 You can find this yellow thrift store lamp makeover here! 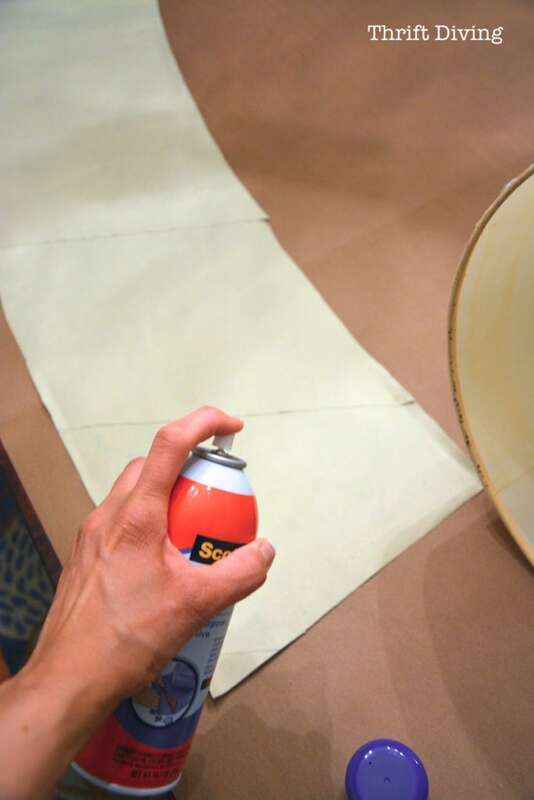 And yes, you can spray paint a lamp shade! 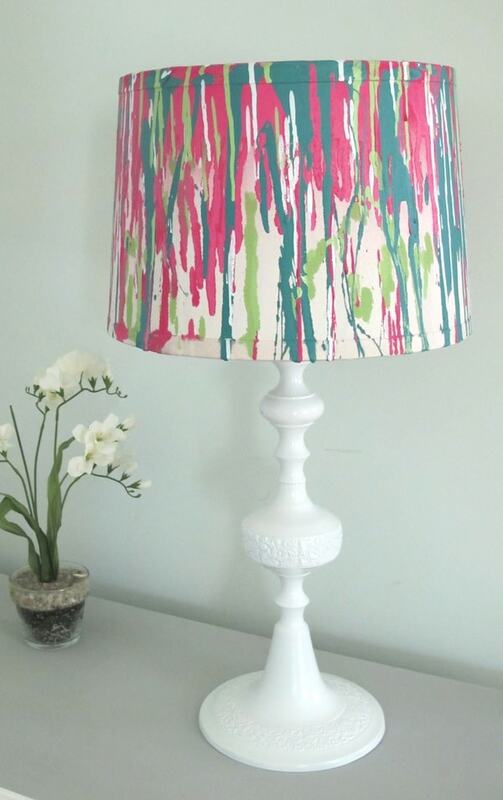 For this lamp shade, however, I sprayed the paint into a bowl first and then drizzled it down the lamp shade, creating a “melted” look with the paint. I love how this turned out! 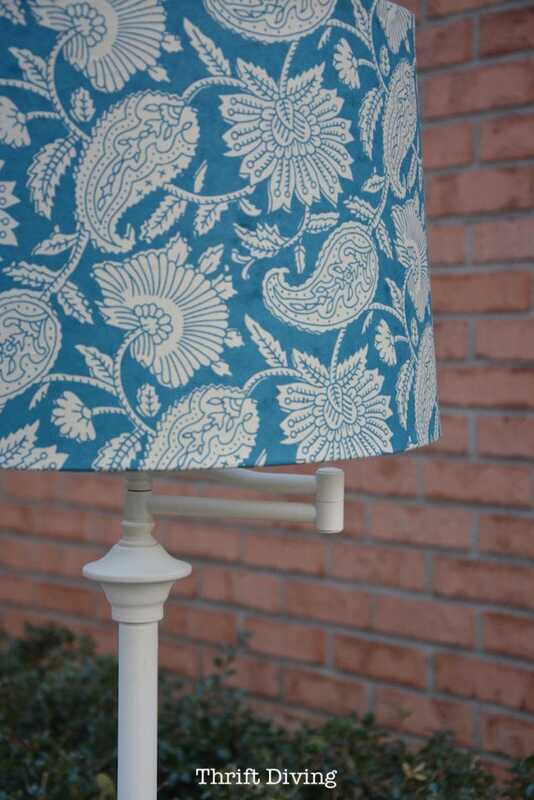 You can see this spray painted lamp shade makeover here! ….with my cute son acting silly. Diggin’ this lamp makeover? Go ahead and SAVE that baby so you can make one, too! 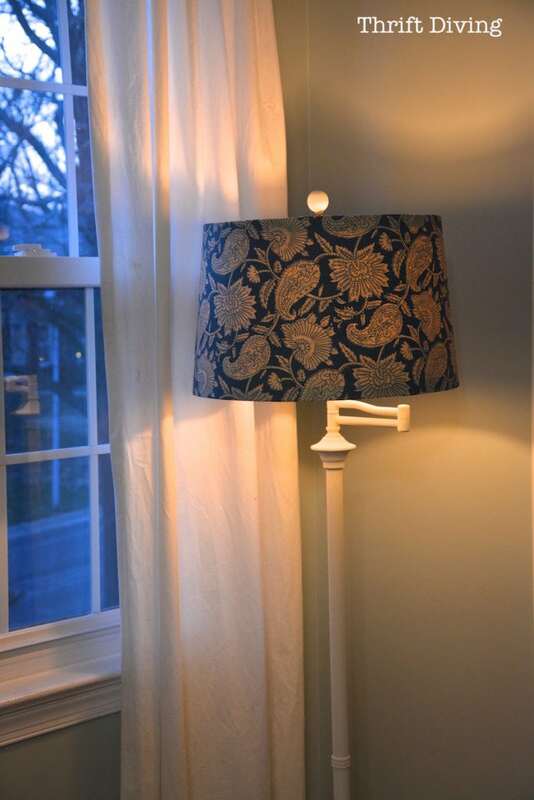 Have you ever did a DIY lamp makeover before? Leave a comment and add to the discussion! Thanks for the great tutorial. I love the makeover using the maps and may need to try it! oh, oh what has been unleashed in our house!!! My mother made lampshades with maps in the 60’s. I love this updated look. I will be trying the tall standing lamp and the map lamp soon. Thank you for sharing. Beautiful projects! Now I’m inspired to update a lamp. Love this project! The map makes a unique and cool shade. I updated my very similar lamp with a coat of Rustoleum spray paint in Champagne Mist. It’s a much softer gold than the original brass. The “silk” shade was the right size and the color so I didn’t update it. 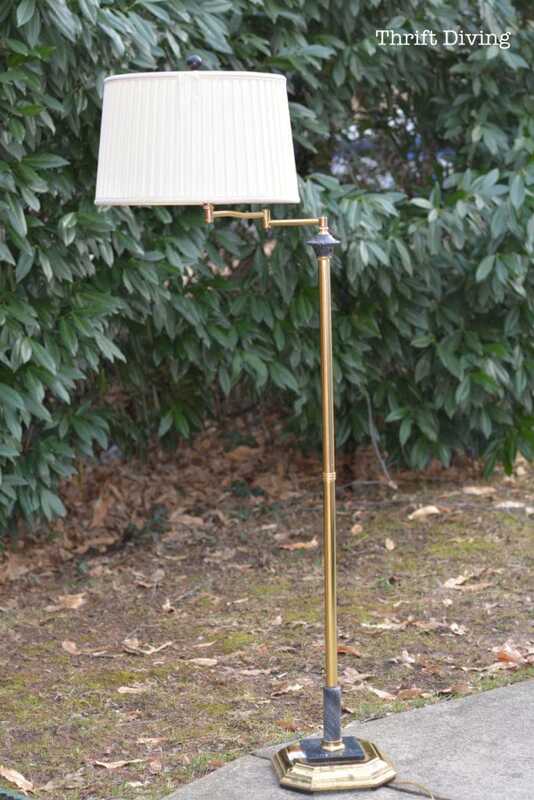 I also had three good quality brass table lamps in the room. I updated those with chalk paint. I used a dark glaze and/or wax to add emphasis to the details of the lamps. The lamps are all traditional shapes but they don’t “match.” I varied the colors so they coordinate but aren’t exactly the same. 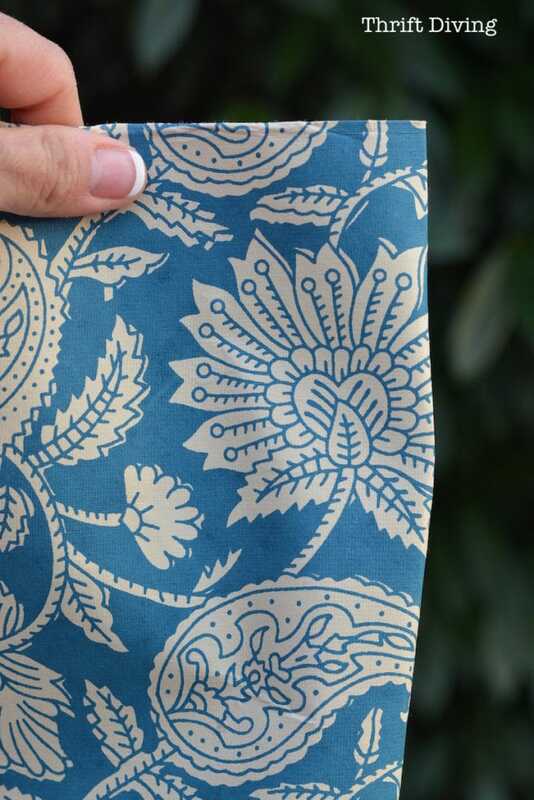 I love the result–they look antique and complement my traditional/European country style. 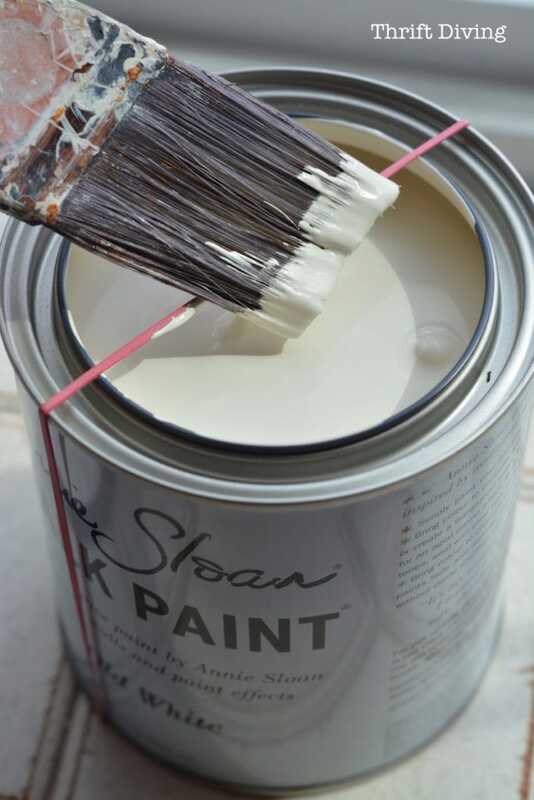 When using the chalk paint do you have to use a finish like a wax of some kind?